zombie dogs | brady, mark a. My friend enjoys watching scary movies, but since her husband passed she won’t now. I can certainly understand as I too have to pull my feet up onto the couch when I get scared from a movie. I don’t want that thing under the couch to get me! (It’s probably just lent.) She says her dogs will usually lye in the living room while she watches most things, but she has noticed they will not go in there if she is watching a zombie movie. She thinks it is because there are no zombie dogs. After hearing this I got to thinking about why there are no zombie dogs. I wondered if it was because dogs don’t taste like chicken. (I don’t know.) But then I realized that zombie are or were humans and when a human is doing something wrong they want others to be doing it too. Sin loves company. My thoughts then turned to what the wages of sin are, and that is death. (Romans 6:23) Zombies are dead humans who are still alive. One reason for them wanting to bite a normal human, other than because they are hungry, is to turn them into a zombie. To join them in their miserable state of being dead, but alive. One thing about death is; it is final. Whatever a person was going through at the time of their death ends immediately when they do. In some circumstances death can be welcomed, and if the person dying has the hope of eternal life with Christ in heaven then there really isn’t anything to fear. I find it hard to believe that the “act” of dying is more painful than the process of living can be at times. So quit living like your dying, and start dying to live. Jesus said in John 10:10 that He came so that we may have life more abundantly. Jesus wants us to be fully alive now and to really live the way God intended when we are in heaven. That kind of life starts by accepting Jesus Christ into your life to be the Lord of your life. By asking Him to forgive you of all of the sin in your past that causes eternal death. Okay. 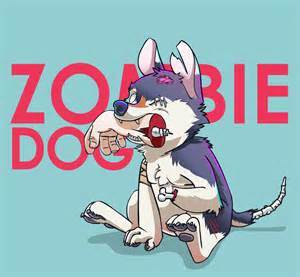 A search on the internet turned up a couple of zombie dog movies.